In my last post I pointed out that the predicted period of tribulation has already happened. Now I'd like to look at the statement Jesus made about those days being shortened. "And except those days should be shortened, there should no flesh be saved: but for the elect's sake those days shall be shortened." Matthew 24:22. By comparing scriptures we found out that "those days" were to last 42 prophetic months, or 1260 actual years. Documentation on the dating of the 1260 years is given in The Patmos Papers. That period extended from AD 538 to 1798. By examining the accounts of Matthew and Mark, it seems clear that it was not the days that were shortened, but rather the tribulation of those days that was cut short. "Immediately after the tribulation of those days shall the sun be darkened...." Verse 29. "But in those days, after that tribulation, the sun shall be darkened...." Verse 24. So, evidently the tribulation of those days would not extend all the way to the end of the days. We should look for a relief from affliction prior to the end of the 1260 years. What would cause that relief? Some people might suggest the Protestant Reformation as bringing relief from persecution. But it didn't really. The Zwinglians killed the Anabaptists. The Calvinists executed Michael Servetus. The Church of England persecuted the Puritans. The Puritans banished Roger Williams. The Bible says that "the earth helped the woman" (Revelation 12:16). We understand that to mean that the relief to the church came from the establishment of the United States of America as a country of religious liberty for the individual. That was accomplished by the signing of the Declaration of Independence on July 4, 1776. So, let's use 1776 as the end of the tribulation of those days. 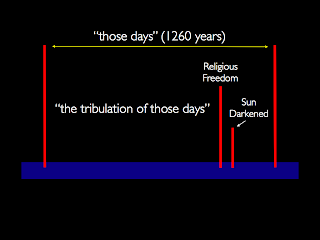 Jesus said, "Immediately after the tribulation of those days shall the sun be darkened." So we should look for the sun to be darkened shortly after 1776. 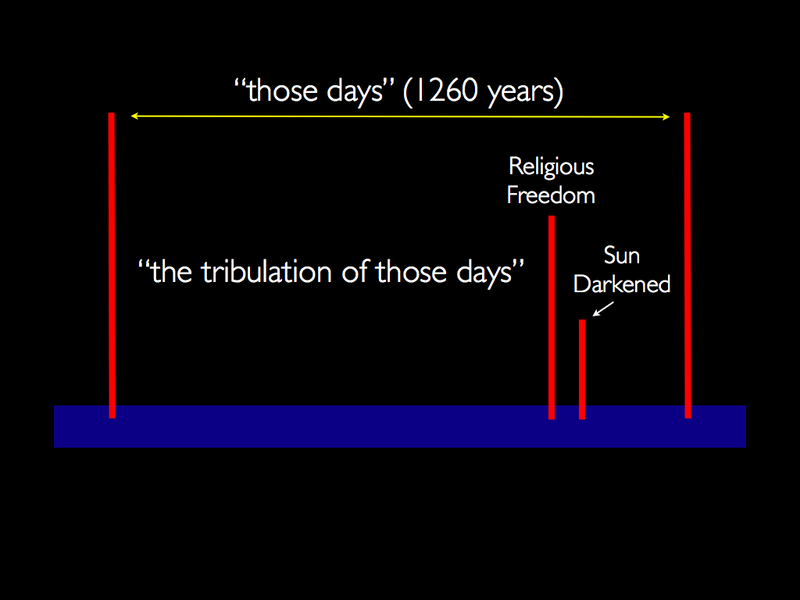 Mark's account says, "In those days (538-1798), after that tribulation (after 1776), the sun shall be darkened." This gives us a short window of time, between 1776 and 1798, in which to have the sun darkened. And the word "immediately" would suggest such an event would occur closer to the beginning of that window. True to Jesus' prediction, in the very land where Bible prophecy was pointing, the sun was mysteriously darkened on May 19, 1780.